So when we were searching for houses one I thing I kept an eye out for were electicity outlets and phone jacks. The house we ended up purchasing was fairly well taken care of for the first point (it had had it’s electricity completely updated a few years ago), but extremely deficient in the phone-jack department. In fact, it actually only had 1 jack in the entire house, and it was in the living room (despite the fact that whoever ‘staged’ the house for showing had placed a phone in the master bedroom, we noticed on our second showing that it wasn’t connected to anything. Sneaky!). So once we took possession, I took it upon myself to add phone to the master bedroom and the room we’ll be using as our office upstairs, as well as replacing the (poorly) wall-mounted jack in the living room. While I was doing that, I figured, I might as well run networking cables so we can more neatly manage the networking of the xbox in the livingroom, the computers in the office, and anything else we might introduce at some point in the future. There are a ton of websites out there that talk about doing this exact project (this is one a I read a lot), in far more detail than I would even begin to put into any summary of the work that I’ve done, so I’ll leave the details of this project out. I will comment however, that it took a lot more time than I expected. Just getting the panel pictured above up and wiring all the phone lines into the demarcation point took around 4 hrs, although with a more organized house (read: not in the chaos of having just moved in) it probably could be done a lot quicker. FYI: I’ve added a bunch of flickr ‘notes’ to the above photo sumarizing each part of what you can see. Everything is up and running now, and the computers are all talking to each other nicely, which is far more exciting than it should be. It was a little nerve wracking, however, to not have an ethernet line tester to ensure all my connections were sound (they were around $90 at Home Depot, so I passed), but I seem to have passed without having to redo any of the lines. Anyways… I’m very satisfied with what we have, and it’s got room for expansion should I feel the need to add jacks into our kitchen at some point. The only part I’m not 100% sure about is the use of the 10/100 Fast Ethernet Switch, instead of having a router in it’s place. 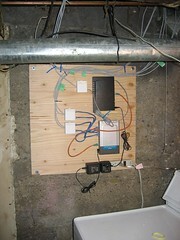 Everything works fine with this setup, but perhaps it would be better or safer to have a router there. Regardless, it’s done now, and now I can get back to unpacking and getting our office set up.